Selling drinks in Africa and clinic marketing – valuable lessons for growing your clinic. In the first ten years after leaving university I worked primarily in Africa, based out of the UK. A complete career U-turn led me into healthcare but now, as I look back, I can see how certain strategies used by multinationals can be applied to clinics of any size. I had several jobs which included two working at large drinks companies. 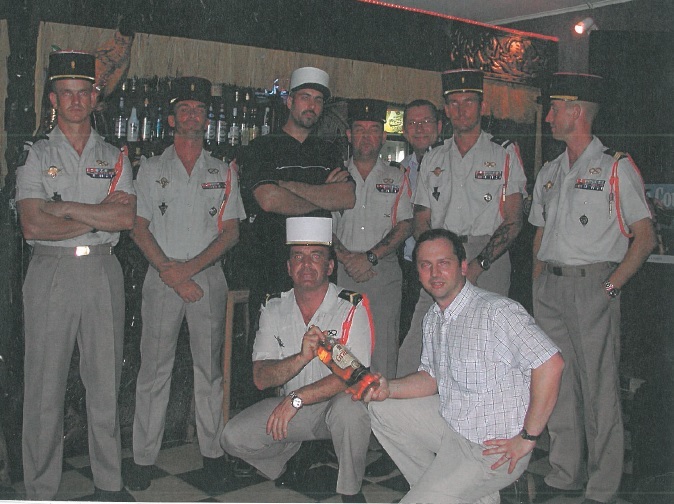 I dug out this old photo out which sees me, bottom right, with members of the French Foreign Legion in a bar in Gabon, Central Africa. So what does selling Grants whisky have to do with clinics?? It’s about the approach to marketing. In the drinks industry the last three months of the year, and in particular Christmas, are when you generate most of the sales volume. But, in order to get people to choose your brand, you have to have your brand in the purchasers mind when they are at the supermarket shelf, in a bar/restaurant or thinking about a gift for someone. In that moment of decision a synopsis of all the brand messages they have ever been exposed to goes through the purchaser’s mind. A lifetime of brand messages creates an attraction to a brand, but also the position of the bottle on the shop shelf/bar makes a big difference: “Eye-level is buy level” and then you have the influential promotions, special offers etc to sway the decision at the crucial moment. Most clinicians will say with pride that “word of mouth” is their main source of new patients. That is generally true, but I believe that this can partly be explained by the fact that very few clinicians have a consistent marketing strategy throughout the year to bring them patients from other sources. 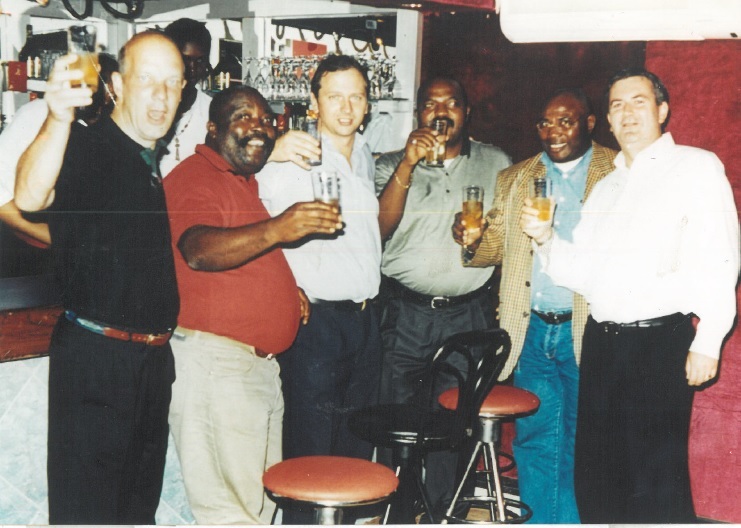 If we relied on word of mouth in the drinks business, we would never grow the brand. Likewise I visit clinics who invest a lot (time and/or money) in marketing and they are much busier than their competitors. You see, like the person who buys one or two bottles of whisky a year, a potential patient may not be in pain right at the moment. You have no idea when a person’s pain will be bad enough that they go looking for a clinic (brand). Not all marketing works, but so often, clinicians expect an immediate response to a piece of marketing. Then, when it doesn’t come (and they ‘lose money’), they retreat to thinking that “word of mouth is the only marketing that works”. Perhaps the ad/message/activity wasn’t quite right anyway, but consistency also plays a big part. It takes time to build trust in a brand, being there (visible) consistently with your brand plays a big part in building trust. It is much harder to get people to switch a brand of whisky they have been drinking for ten years, than it is to introduce new consumers to your brand. In this photo you can see me centre (slightly worse for wear!) in a nightclub in Cameroun. Drinks promotions in bars highlight your brand. Any new consumer you engage, like any new patient is likely to stay loyal to you provided you look after them. Plus, the non-whisky drinkers pick up a powerful brand message and one day they may have cause to choose a brand for themselves or someone else. So, back to the person with a back ache: most people live with their pain and take painkillers. How many times do you hear people say “it was finally time to get my back looked at”. Like the decision to purchase a bottle of Glenfidich whisky, the brand influences have been built up over time. Drinks companies invest heavily in that. As pain develops, so does awareness of pain remedy messages. It’s been well documented that when you think of a new car you want, you suddenly see that make and model everywhere. It’s the same thing. For a clinic, even a few hundred pounds a month to get your BRAND visible to people in your community, gives you much more of a fighting chance to be selected over the competition- in that moment in the year when someone’s pain is sufficiently bad that they want to take action. IMPORTANT – The other reason consistency is important is because it keeps your brand visible to your existing customers. Of course, the relationship between a patient and their clinician is much more profound than the relationship between a consumer and a brand of whisky! However, I am yet to meet a clinician who hasn’t told me that they acquire patients from their competition. Now, when everyone says that, I’m afraid that means that some of those patients who left your clinic and never returned … didn’t all feel that they had a satisfactory experience with you or they aren’t that fussed where they go so are ready to respond to new messages from other clinics (like the eye level purchase decision at the supermarket shelf). NOTE we Brits are very polite. I once sat through a consultation with an osteopath, I answered the right questions but I didn’t get a connection with the guy so I never went back. Now, he may have thought that he restores patients in one visit but that is not the case every time. If you provide a good service, you have an opportunity to draw in disgruntled patients and those who don’t have particular loyalty – and there again is a reason to stay visible. Remember 90% of clinics are passive and don’t market themselves consistently to grow their practice. Therefore, you don’t need to invest too much to make yourself visible and stand out from the crowd. I hope this helps. It remains for me to say Sláinte (SLAHN-chə) which means “health” and is a Gaelic toast to use whenever you drink Scottish water. As we expand availability of IDD Therapy treatment for discs and nerve pain, we encourage all IDD Therapy provider clinics to write up case studies. Ultimately we want to refine the patient cohort so that we get better predictability of outcomes and use the strength of the network for multi-centre data analysis. We use subjective and outcome measures and I wanted to share the outline and structure of a case study template so that if someone had some suggestions for improvement, they could contribute. The template has some details specifically for IDD Therapy treatment, but they can be deleted for use with other conditions, if someone wanted to. The IDD CASE STUDY TEMPLATE is a word document you can click to open. There are many different treatments for back pain and as the somewhat cruel saying goes, there is more than one way to skin a cat. IDD Therapy spinal decompression is a tool used by clinicians when they want to decompress, distract and mobilise a targeted spinal segment in a manner they can’t achieve with their hands, or traditional traction.